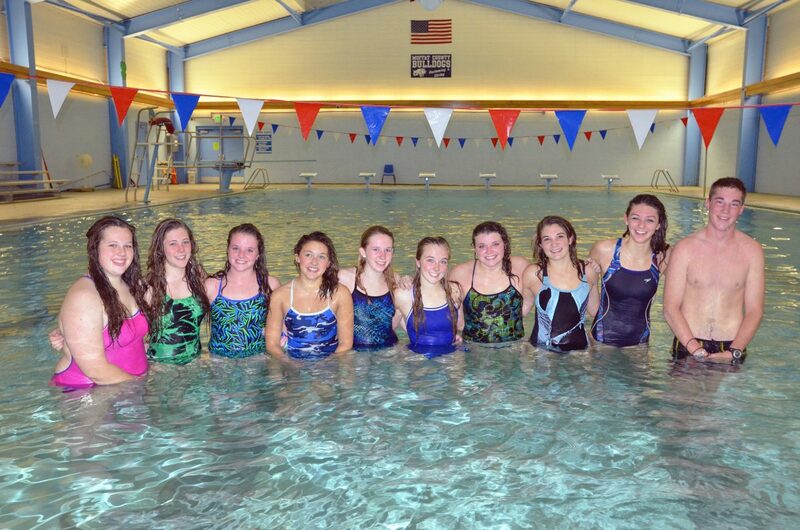 The Moffat County High School girls swim team in the shallow end of the MCHS pool. From left, Jaycee Holman, Karmen Christopher, Emma Samuelson, Kayla Nash, Natelyn Singleton, Allie Dilldine, Alex Samuelson, Bailey Kurz, Micah Espinosa and manager Chris Kling. Not pictured: manager Jesse Kurz and coach Jeff Wert. The Moffat County High School girls swim team is seeing the first wave of changes for the school’s aquatic sports, but they’re powering through and vying for both a strong start and finish to their season. This year’s team has both veterans and rookies, but the newest addition is coach Jeff Wert, taking over the duties from longtime component of MCHS and Craig swimming, Meghan Francone. With experience of his own as a competitive swimmer, Wert has focused heavily on the basics of the sport, such as breathing and stroke technique, in the initial weeks of practice. With three of the 11 girls on the team having never raced in the water before, those new to the water are taking to it well, he said. Members of the boys team — which Wert will also supervise this spring — also aid in the training process. The season begins with the team traveling to Glenwood Springs on Dec. 5, and a competition at MCHS won’t take place until the middle of the schedule in January. Originally a larger meet, not all the teams will be able to attend, though just hosting Aspen will keep the Bulldog swimmers continually primed. “Since I’m new here, I’m hoping to get to know who our rivals are,” Wert said. Aspen, Fruita and Gunnison are among the schools expected to have the times to beat, a fact not lost on Moffat County’s two seniors, Micah Espinosa and Alex Samuelson. With seven years of high school swimming between them, they’ve been able to master their individual events more and more each year, but it’s getting in the flow of proper teamwork that will help make the season’s results stronger. “I think our relays are going to be the hardest thing for us, because it’s hard to find girls who work the best together,” said Alex, a participant in both freestyle events and team relays. Espinosa does the individual medley and freestyle, as well as the breaststroke, the latter her favorite. “I’m probably best at that one,” she said. The mantle of leadership on the team is on the duo, and it’s something they’ve taken to heart in practices with their less experienced teammates. “We want to set an example for them, let them know when they’re doing good,” Espinosa said. Alex began providing guidance for her younger sister and first-time swimming teammate, Emma, before the season began. Their mother, Shannon, also assists with training. The siblings, as well as fellow swimmer Karmen Christopher, were all on the roster for the varsity volleyball team this season, but the conditioning in the pool is a great deal different.